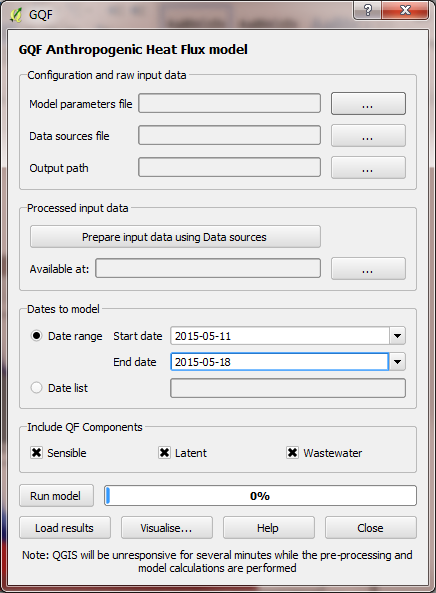 This tutorial demonstrates how the GQF software is used to simulate anthropogenic heat fluxes (QF) for London, UK, in the year 2015, using a mixture of administrative and meteorological data. UMEP is a python plugin used in conjunction with QGIS. To install the software and the UMEP plugin see the getting started section in the UMEP manual. As UMEP is under constant development, some documentation may be missing and/or there may be instability. Please report any issues or suggestions to our repository. In order to proceed, you will need the zip file named GQF_Inputs_1.zip from the UMEP tutorials data reopository. local machine and note the path to each file (e.g. C:\GQFData\BuildingLoadings_Industrial.csv). Attribute to use. A shapefile attaches one or more attributes (e.g. population or energy consumption) to each spatial unit. The name of the relevant attribute must be specified here. 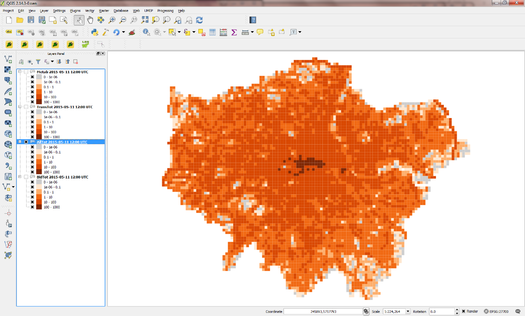 Click here for a guide explaining how to identify the feature ID, attribute to use and EPSG code of a shapefile using QGIS. A shapefile also defines the so-called output areas, which are the spatial units (sometimes pixels) of model output (one QF estimate per area). These are needed because the spatial units of the various input files may not all match up. The output areas can either be one of the input files, or a totally different set of areas. 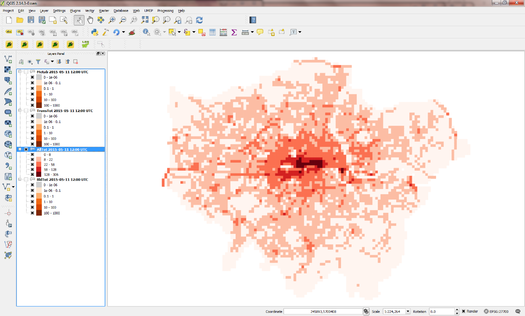 In this tutorial, one of the population datasets is used to keep things simple. The data sources file needs to be updated so that it can find the various data files, and understands what to do with them. A full description of the Data sources file contents is available here, but this section shows how to build up the entries. There are several sections in the data sources file. Each is bounded by &section_name and ends with “/” and deals with a different part of the input data. Open DataSources.nml using a text editor (we recommend Notepad++). The following steps show how to update the entries according to the information gathered above. An arbitrary start date of 2011-01-01 (1st january) can be used for the data shown. Specifying the residential population data. 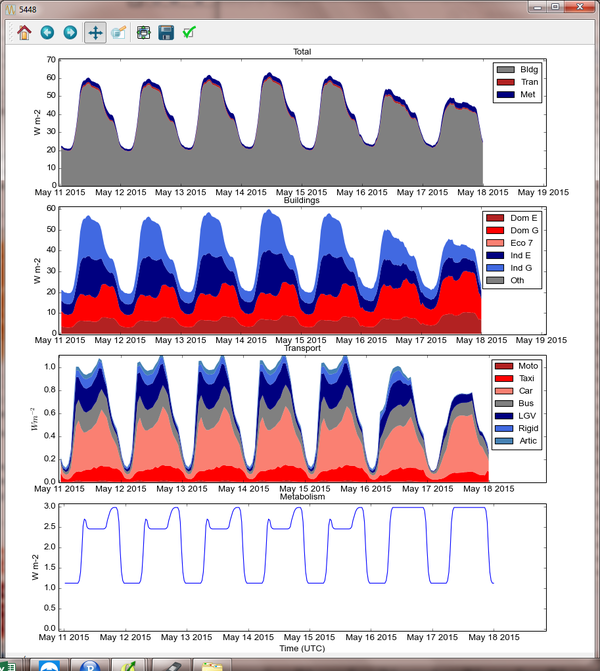 GQF uses annual total energy consumption shapefiles, and needs to know how to vary energy consumption on different dates (e.g. winter is likely to have more fuel use than summer). This is captured using real data from the energy grid. 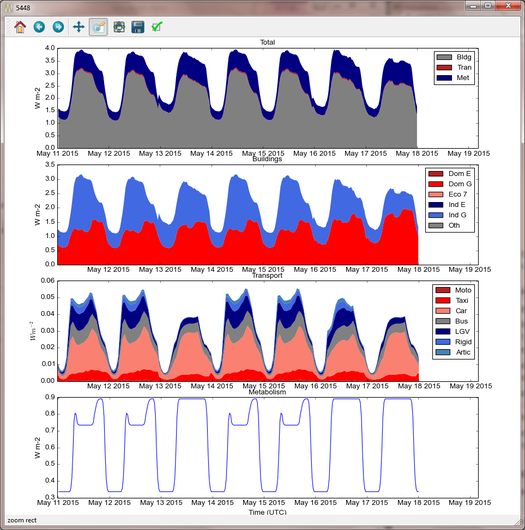 The 2015GasElecDD.csv file contains each day’s total gas and electricity consumption. GQF then scales the annual consumption based on this each day. Only the year(s) represented by the data should be modelled, but if only past years are available GQF will recycle it for later years, offering the closest sensible match to time of week and time of year. The metabolism.csv file contains a weekday, saturday and sunday variant of this information, and copies for each daylight savings regime in the UK to account for changes in the summer. It should be possible to complete and/or verify the first four entries using the table and information above.
! 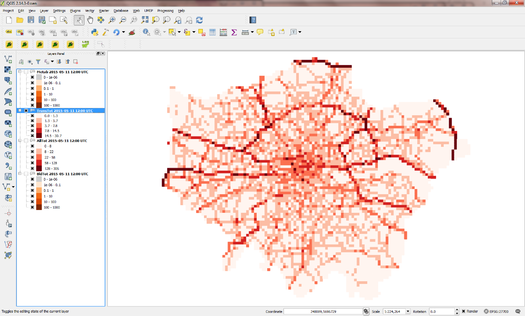 Specify attribute names if data is present in the shapefile. Each profile is a week long, and these profiles control changes to the total volume of traffic each day. Click the … buttons in the Configuration and raw input data panel to browse to the parameters.nml and DataSources.nml files. A pop-up error message will warn of any problems inside the files. Output path: A folder in which the model outputs will be stored. It is strongly recommended that a new folder is used each time. Click Prepare input data using Data Sources button. This may be a time-consuming step: It matches the various inputs to each output area. Where output areas and input shapes are not identical, it also splits population or energy use across output areas based on their overlapping fractions. Once this step is complete, the available at: box will become populated. This folder contains the disaggregated data needed to run the model. Tip: Save time in future: If the exact same input data files are used in a later study, then the “prepare” step can be skipped: click the “…” button and navigate to a folder that contains the relevant disaggregated data. It will then be copied to the new output folder and used as normal. Choose a start date of 11 May 2015, using the start and end date boxes, then select “Run”. Once the model run this is finished, press visualise outputs to view some of the model results to open the visualisation tool. Use the visualisation tool to create a map of all the QF components at noon (11:00-12:00 UTC) on May 11 by selecting that time and pressing Add to canvas. This may take a moment to process. Close the visualisation took and return to the main canvas to inspect the four new layers that have appeared. De-selecting a layer in the Layers panel removes it from view. Leaving just AllTot (total QF ) visible, there isn’t much structure in the colours. Right-click the QF layer, go to Properties > Style, change the colour ramp to “Reds” and choose Mode: Natural Breaks (Jenks). This shows much more structure, although the grid borders are distracting. These can be removed by double-clicking the colour levels and choosing a border colour the same as the fill colour. and click an output area of interest. This turns yellow. Right-click it and select the option that comes up. Information about the output area then appears on the left, with the ID shown. Make a note of this. 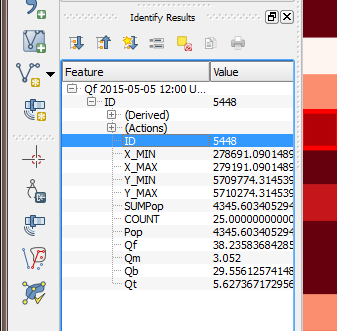 Return to the visualisation tool, choose output area 5448 and click show plot. Time series of each QF component then appear for the week. Note the lower traffic activity and different behaviours on Saturday and Sunday, when people are expected to not be at work. Compared against the results from Tutorial 1, the curve on May 13 in each sub-plot now resembles May 17 (a Sunday) rather than the weekdays around it. The emissions are far lower than those in Tutorial 2a, showing how latent heat is a relatively small contribution. Consuming electricity emits no latent heat, unlike gas, while metabolism now represents a larger fraction of the total.